An overhead view of the labyrinth in the sanctuary at First Congregational Church in Montclair, NJ. One of my favorite authors is the late Marsha Mehran, author of the Babylon Café novels set in northwest Ireland in the 1980s. There is a scene in the second novel, “Rosewater and Soda Bread,” where the Italian widow Estelle Delmonico leads a mysterious mute girl – who is recovering from serious physical and psychic wounds – on a walk around her garden overlooking Clew Bay. The path is not described as such, but it sounds as if the path in Estelle’s garden is a form of labyrinth. Many religions and belief systems around the world have rites and traditions in which walking plays an important part: pilgrimages, retreats, meditations and so forth. There is a book by Robert and Martha Manning, called “Walking Distance: Extraordinary Hikes for Ordinary People,” which talks to some extent about spiritual walking and pilgrimage routes, like the Camino de Santiago in northern Spain. A labyrinth is, basically, another form of hiking trail, compressed into a circle of loops; I’ve noticed a few times that the loops look a little bit like the switchbacks on a trail map. Most of us have heard of the labyrinth in the cathedral at Chartres. 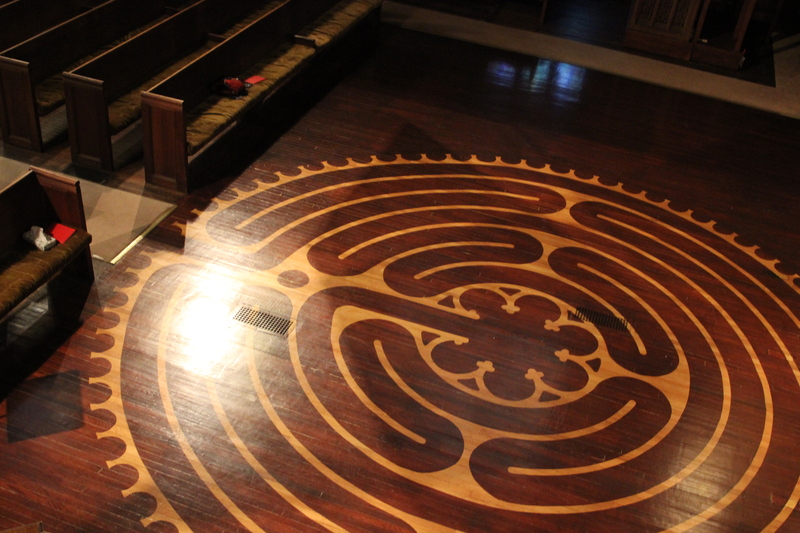 Today, a number of houses of worship have either a canvas labyrinth – a design painted on a giant canvas mat – or a permanent labyrinth embedded in the floor of the sanctuary. And labyrinth walks are especially popular during the Lenten season. At First Congregational Church in Montclair, not too far from where I live, the church installed a labyrinth in the sanctuary about four years ago, and on most Wednesday evenings during the year, they invite people to come in and walk. I’ve done it a few times, when I’m having a moment where I can’t get my brain to quiet down (an all-too-frequent occurrence these days); sometimes I’ll drop in if I’m out for a walk into town in the evening. It’s always very quiet, except for the pad-pad of people’s feet as they make their way around the loops, and the lights are dimmed except for some battery candles around the edge. If you’re walking through one loop and someone is coming back in the opposite direction, one person just steps aside, and both continue walking. It’s the same with trail etiquette. One day earlier in the fall, I reached out to the pastor, Rev. Ann Ralosky. I introduced myself and told her that I was working on a blog posting about labyrinths. And she was kind enough to invite me to come by the church one morning so we could chat, and so I could take a photo of the labyrinth. There are many possible reasons why a labyrinth has such an intense pull for people, she told me. Part of it is the symbolic nature of death and rebirth, the life cycle and the spiritual journey. On the physical side, she said, it is thought that the loops of the labyrinth are an echo of the crevices in the brain and the bowels. Additionally, the action of walking itself is an activity that uses both sides of the brain.